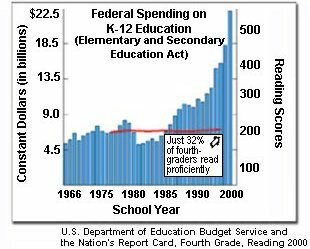 During the past 40 years, funding for primary education has increased dramatically, in terms of constant dollars; yet standardized testing scores show little to no improvement and sometimes even deterioration. Nor does empirical evidence show any marked signs of improvement in education. It's disingenuous to blame the tests, since other countries are able to outscore the United States, as are certain localities able to outscore the U.S. national average, without "teaching to the test."